Today arrive in the Emerald City of Seattle. Meet your Tour Director and transfer to your hotel for a two-night stay. This exciting Pacific Coast Adventure will take you from the Pacific Northwest along spectacular parts of the Oregon & California Coasts to the beautiful city of San Francisco. Tonight enjoy a Welcome Dinner with your fellow travelers. This morning enjoy a Seattle City Tour. Start by visiting the space Needle where the experience features an elevator ride to the observation deck 520 feet above the city streets. Built for the 1962 World's Fair, the iconic tower can feature views of the Cascades, Mt. Rainer, ferries, boats, seaplanes & bustling downtown. The tour continues featuring historic Pioneer Square, the Chittenden Locks & Fish Ladders, the Seattle Center and a stop for great pictures and views of the Space Needle. End your touring at the famous Pike Place Market. Built in 1903, the waterfront market is home of the flying fish & the original Starbuck's Coffee. Enjoy time to wander, shop & grab a bite to eat. Enjoy the rest of the day to explore this wonderful city at your own pace. This morning travel south & visit the Mt. St. Helens Visitor Center to learn about the May 1980 eruption. Shaken by an earthquake measuring 5.1 on the Richter scale, the north face of this tall symmetrical mountain collapsed in a massive rock debris avalanche. This afternoon enjoy a Portland City tour to see the Columbia River, Washington Park with its famous International Rose Test Garden, Pioneer Courthouse Square and the famous downtown food trucks. Learn how Portland has transformed from small lumber town into a bustling big city with a lively downtown. Later check into your hotel in the Portland area for an overnight stay & evening at leisure. This morning travel through the fertile Willamette Valley, containing beautiful vineyards and home to much of Oregon's agriculture. Next visit the historic coastal town of Newport, founded in 1866. Continue and explore the magnificent Oregon Coast and visit the Oregon Dunes National Recreation Area, a unique 40 mile stretch of windswept sand which is the largest expanse of coastal sand dunes in North America with dunes towering up to 500 feet. Continue to Coos Bay and enjoy your evening at leisure. Early this morning travel south along the Oregon coast to Gold Beach & board your vessel for a Rogue River Jetboat Trip. The half day scenic adventure features abundant wildlife and pristine wilderness along the 'Historic Mall Boat route' to the small town of Agness where you will stop for an included lunch. This afternoon your motorcoach ventures into California. Stop to visit famous Redwood National Park home to the majestic coast redwood trees, the world's tallest living things which can grow to 350 feet. Late afternoon arrive in Eureka and drive through Old Town to view several of the famous & beautiful Victorian Homes. Tonight enjoy dinner with your fellow travelers at a popular lacal restaurant. This morning depart for the Avenue of the Giants. This world-famous scenic drive is a 31-mile portion of old Highway 101 with 51,000+ acres of redwood groves. The Avenue of the Giants is surrounded by Humboldt Redwoods State Park which has the largest renmaining stand of virgin redwoods in the world. Continue south and travel into Sonoma County, home to one of California's great wine regions. Stop for a Sonoma Valley Winery Tour & Tasting experience to sample the local product and learn about wine making. 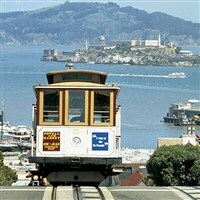 Later cross the majestic Golden Gate Bridge into one of the world's most amazing cities, San Francisco. Arrive for your two-night stay & an evening at your own pace in the exciting "City by the Bay". 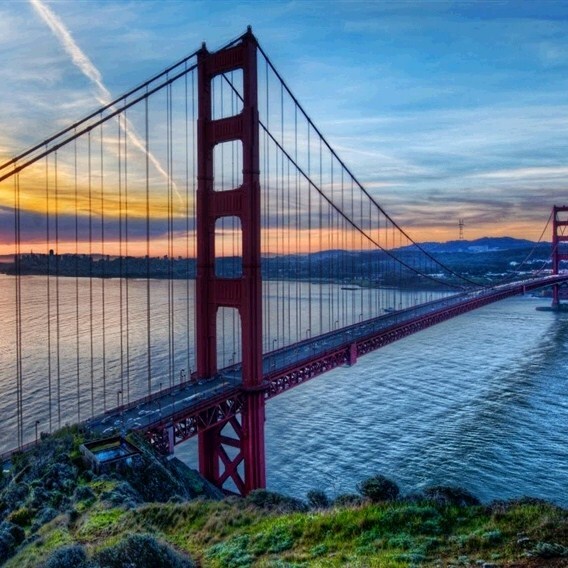 Today enjoy a San Francisco City Tour to see the Civic Center area, Chinatown, Golden Gate Park, Union Square, Seal Rocks, Pier 39, Pacific Heights and a stop at Vista Point for spectacular photos of the Golden Gate Bridge. This afternoon enjoy this amazing city at your own pace. Maybe take a cable car ride, enjoy a chowder filled sourdough bread bowl or shop in Union Square. Tonight enjoy a Farewell Dinner with your fellow travelers in San Francisco's famous Fisherman's Wharf. Today fly home with wonderful memories of your Pacific Coast Adventure. Includes: Roundtrip airfare from Pittsburgh International Airport, seven breakfasts, three dinners, professional tour director, motorcoach transportation, hotel transfers, admissions and sightseeing per itinerary, and baggage handling and taxes.